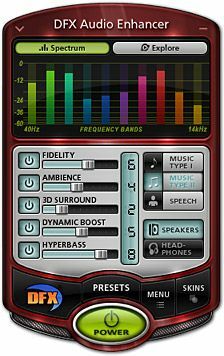 Free download DFX Audio Enhancer latest version. DFX Audio Enhancer boosts the sound quality of all of your music, videos, Internet radio, games, and other programs. Simply turn on DFX and be immersed in HD quality sound. DFX dramatically improves the sound quality of your favorite programs and websites with 3D Surround, higher fidelity, booming bass and more, providing exceptional playback quality on your PC. The latest version also includes the Explore music discovery feature, which helps you find new music, artist videos, song lyrics, similar artists, and more. Simply install DFX and start playing music, videos, games or anything else with sound. That’s it! With its standard settings you’ll immediately be amazed at the added clarity and punch that your PC now provides. Fine-tuning your audio settings is also an easy option. DFX has an intuitive interface with tooltips to guide you, along with a complete list of factory-tuned presets for all kinds of music. You can even create and save your own custom preset. Click the Explore button to discover new artists and songs, access music videos, view song lyrics, and more. You can also change the look of DFX by choosing from the many available DFX skins in the online skins library.